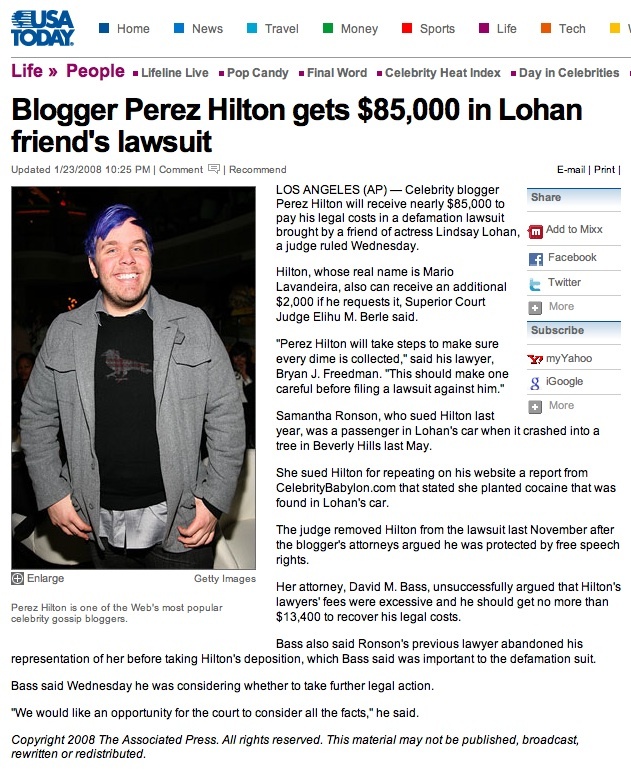 LOS ANGELES (AP) Celebrity blogger Perez Hilton will receive nearly $85,000 to pay his legal costs in a defamation lawsuit brought by a friend of actress Lindsay Lohan, a judge ruled Wednesday. Samantha Ronson, who sued Hilton last year, was a passenger in Lohan's car when it crashed into a tree in Beverly Hills last May. She sued Hilton for repeating on his website a report from CelebrityBabylon.com that stated she planted cocaine that was found in Lohan's car. The judge removed Hilton from the lawsuit last November after the blogger's attorneys argued he was protected by free speech rights. Her attorney, David M. Bass, unsuccessfully argued that Hilton's lawyers' fees were excessive and he should get no more than $13,400 to recover his legal costs. Bass also said Ronson's previous lawyer abandoned his representation of her before taking Hilton's deposition, which Bass said was important to the defamation suit.